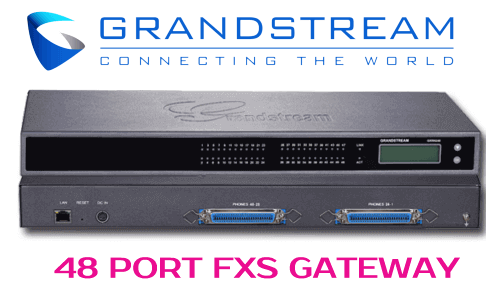 Grandstream GXW-4248, as you can conclude by its very name, it supports up to 48 FXS ports. This VoIP gateway is used for connecting the analog devices of phones and fax machines that remain in the same network with each other. This device has support for a wide range of Voice and Fax codecs. This is combined with 48 RJ11 FXS ports in addition 50 Pin Telco Connector. All of these features combined, these make the GXW4248 the most powerful VoIP Gateway offered by Grandstream. The credit also goes to its versatile set of uses. This is defined as the next generation high-performing 48 Port VoIP Gateway that is compliant with the DSIP standards is working completely fine with other VoIP systems, Analog PBX and phones that are available on the market. Moreover, this device features the multiple FXS analog telephone ports that are well complimented by the voice quality and dialling plans. All of this is topped up with improved security standards for this device as it proves to be a great option for businesses that need to use the far most advanced telephone technology without investing something big. This PBX is establishing a name for itself on the base of its ability for handling a high volume of calls at a time. This product offers the small and medium business the cost-effective hybrid IP with an analog telephone system which allows them to take benefit of VoIP communication to safe keep their investment on the already existing analog phones and fax machines. Not to mention, it also adds the Legacy PBX systems. The Grandstream GXW-4248 provides VoIP connectivity or up to 48 analog devices, well all the credit goes to its RJ 21 50 Pin Telco connectors. This gateway allows the small and medium business to use a cost effective enterprise grade PBX to use with their legacy equipment. However, they are allowed to take advantage of VoIP technology while they are at it. With the help of VoIP, you get to enjoy the better voice quality with rich features and easy provisioning. This is combined with strong performance even when it comes to multiple voice calls. As this company delivers a hybrid IP and analog system, it lets you take advantage of VoIP while you get the opportunity to preserve your already existing investment on analog phones and even PBX Systems.